UCSI University is a private university in Malaysia. Built on the principles of audacity, perseverance, integrity and excellence, UCSI University is a leading institution of higher learning with campuses in Kuala Lumpur, Terengganu and Sarawak, Malaysia. By providing and sustaining education within a well-organised, active and co-operative learning community within the community where the social nature of learning is understood, suitably resourced and administered both on and off campus, including curricular and extra-curricular learning activities, the YBB excels in its purpose and approaches. For example the Hands of Hope Project is a long-term voluntary project established in 2014 with a mission to sow seeds of change to the underserved communities through education. Co-founded by three UCSI students, this project aims to provide quality education to the under-served communities with the aim of equipping them with life skills, to instill volunteerism among youth by providing a platform to reach out to the underserved communities, and to offer youth an avenue for personal growth and development. Since the establishment of Hands of Hope, more than 200 students have volunteered with this project, reaching out to children from a special needs school, a children home and two refugee schools. Every semester, Hands of Hope connects students to volunteer at underserved communities through providing extra classes for the children on a weekly basis, mainly in academic subjects such as English, Mathematics and Science. Aside from teaching academic subjects, Hands of Hope also provides music classes at the refugee schools in hope to bring a more holistic learning experience for the children. Currently, we are looking into the expansion of lessons into more areas such as carpentry, sewing, cooking and so on with the goal to equip these communities with life skills which can provide them with better livelihoods. There are also several events and projects under Hands of Hope to raise awareness, generate funds and create systems for the underserved communities to be self-sustainable. There are many projects under the SEP (Scholar’s Enrichment Programme) that mold and develop our students to have the sustainability mindset. Since 2015, developmental programmes were meticulously designed for through which individuals are shaped to be ever ready to champion of tomorrow’s challenges. One of the projects, Journey to Belong, is an awareness programme supported by UNHCR, the UN mandated agency to work with refugees and stateless persons. 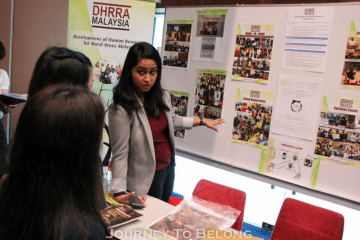 Through this programme, awareness is periodically created among the public and the youth community on the issue of statelessness in both Malaysian and global contexts, aligning ourselves to the UNHCR’s Global Campaign to End Statelessness by 2024. Stateless people are often denied basic rights such as getting an education, access to healthcare services, freedom of movement, securing a career, becoming an eligible voter, buying a house, and even getting married. Ensuring sustainability for the impact created, through turning the project idea into actual running business and/or empowering the community whom they worked together to take over the project. Talent development and succession planning, the students are provided with opportunities for experiential learning in leading key projects and driving significant results, at the same time have succession plans in place for project sustainability. YBB initiatives largely emphasis on building leadership and key competencies. SEP is a talent development programme provided for the scholarship recipients of UCSI University. This programme is led and executed by senior students from the YBB community. SEP serves as a platform for holistic talent development for the rest of the YBB community to have the sustainability mindset and to be ever ready for tomorrow’s challenges. The students undergoing SEP will find themselves developing competencies by initiating sustainable community projects. Leadership Lecture – Being one of the flagship events of YBB initiative, this platform provides students to learn real-life leadership practices and network with industry leaders and ministers. The leadership lecture has covered a vast aspect such as creativity & innovation, as well as humanitarian. Till date, we have hosted the lecture having over 30 speakers who are expert in each of their industry and benefited over 1,500 students. Initiative Z is a zero waste movement formed as one of the sub-program under SEP. Initiative Z is led by students of UCSI University dedicated in combating waste crisis in Malaysia. This initiative designs and implements a variety of engineering projects and sustainable practices that focus on waste aversion, diversion and resource substitution, to help our campus to be as zero waste as possible. JTB is an awareness programme supported by UNHCR, the UN mandated agency to work with refugees and stateless persons. Through this programme, awareness is periodically created among the public and the youth community on the issue of statelessness in both Malaysian and global contexts, aligning ourselves to the UNHCR’s Global Campaign to End Statelessness by 2024. Stateless people are often denied basic rights such as getting an education, access to healthcare services, freedom of movement, securing a career, becoming an eligible voter, buying a house, and even getting married. Christened after U-Schos’ many outreach initiatives with Burmese refugee, this health project educates underserved communities on numerous health aspects and increase their access to primary healthcare. They also distribute hygiene kits and conduct cooking classes for the mothers. Till date, there are over 80 total beneficiaries benefited through this project. Breadboard – student-led incubator centre aims to inculcate entrepreneurship spirit among youth and bridging then in pursuing entrepreneurship path with objectives to drive creative and innovative entrepreneurial solutions that address society’s pressing challenges, and instill continued passion in community engagement for the long-term development of youth. The YBB Community, armed with the two main strategies at hand –the Scholar Enrichment Programme (SEP) and Hands of Hope – has been a source of inspiration and some of its success stories can be emulated by universities around the world. Its current and past activities can be accessed easily at the related website (http://www.uschos.com/) and its social media (U-Schos FB [https://www.facebook.com/USchos/], SEP FB [https://www.facebook.com/USchosSEP/], U-Schos Instagram [https://www.instagram.com/uschos/]). Renown leaders including government ministers, sports champion, well-known entrepreneurs, public listed companies CEOs and other successful business leaders share and engaged with the students and inspire them. The YBB initiative creates opportunities for youth through partnerships and collaborations, allowing them to participate and gain exposure which will inspire them to initiate sustainable actions and impacting their campus community, which in return amplifying YBB’s effort in cultivating student leadership and youth development. 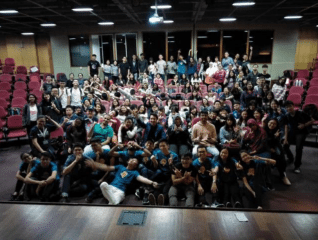 As an example – the recent leadership lecture series participated by university students across Malaysia brought together community champions and volunteering platforms allowing them to gain insights on humanitarian initiatives and subsequently take actions. Members of the YBB community undergo a holistic development journey the moment they begin their university life. In the first year, they undergo a talent development induction, followed by beginning to volunteer for various causes and community or initiating a pilot community project alongside our partners consisting of community champions, NGOs, social entreprises. These projects are planned with sustainability in mind in which the members of the YBB community are required to build a sustainable model of the project to ensure that the efforts taken for the cause and community can be continuous and be replicated by other individuals. After the first year, members of the YBB community will proceed to further involve themselves in the improvements of the pilot project, or they may choose to join other existing projects all the way until the end of their university life. Members of the YBB community can also become the successors of the student committee that administers our youth development pillars. Each semester, we identify our focus for the SEP projects and engage community champions who have a similar focus as collaborators. Their role as collaborators involves exposing the students to the issues that they work on, mentoring the students, and providing support for the projects that the students undertake. This collaboration takes place over a long term period with continuous engagement to assist the students and ensure the successful implementation of the project scope.